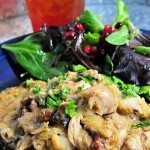 Chicken Pot Pie with Puff Pastry Recipe – A classic chicken pot pie recipe topped with flaky puff pastry and with wholesome, comforting, homemade ingredients. 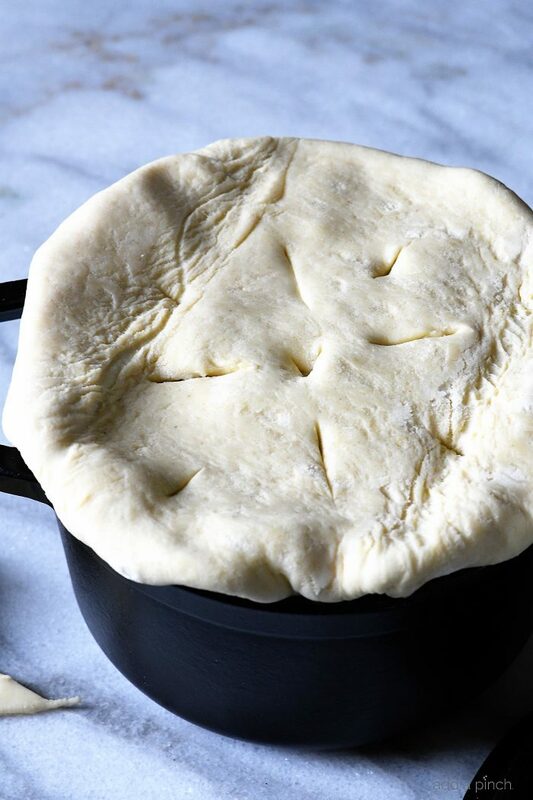 This cozy chicken pot pie recipe is so simple, yet scrumptious; so easy, yet elegant! 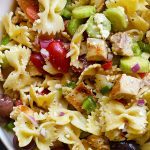 It is just as easy to make for serving on a busy weeknight, a snuggly Sunday or even when entertaining friends and family. 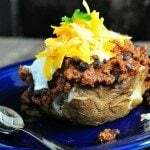 Oh yes, and it is a definite make-ahead favorite in my house! In other words, this recipe is a sure-fire keeper! As soon as the leaves begin to turn and begin to drop, I start thinking of all the delicious dishes that are so appropriate for what I like to call the snuggly season! 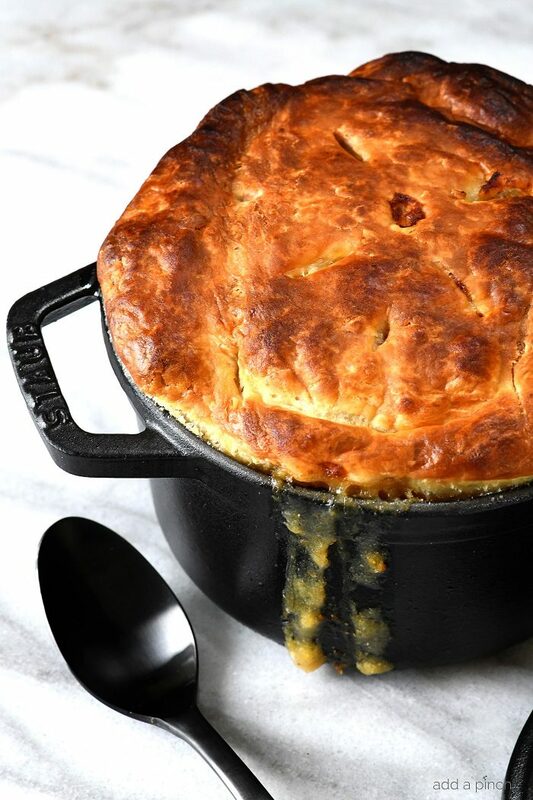 🙂 There are few things as comforting as a deep dish of chicken pot pie. To make my Chicken Pot Pie, I begin by drizzling my olive oil into a Dutch oven set over medium heat. Then, I add my chicken and cook until it is browned. Once the chicken has browned, I remove it to a plate and then add in my onions, carrots and potatoes and cook until the potatoes are just becoming tender. Then, I stir in my butter and flour, salt and pepper and cook until thickened before I stir in my chicken stock. I let that boil for just a bit and add back the chicken and ladle it into my baking dish. Here is where you can decide if you want to serve your chicken pot pie in one big baking dish or if you prefer to portion into individual containers. 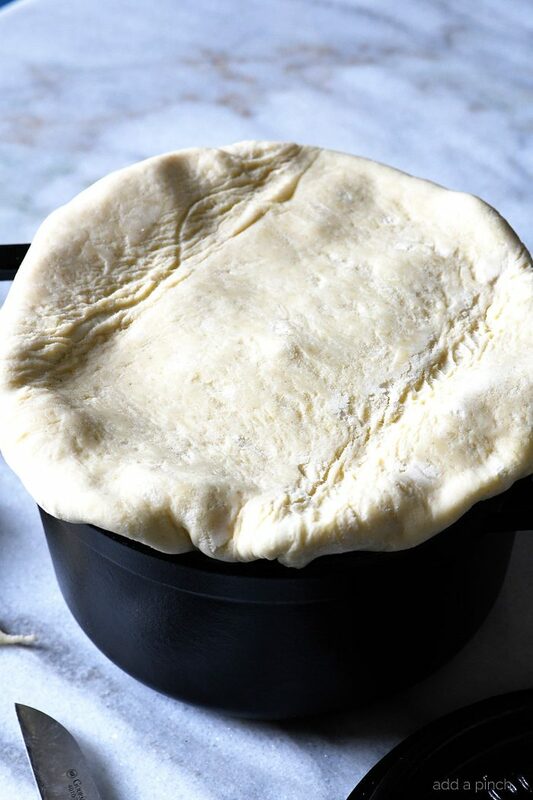 Once you’ve gotten all of your chicken pot pie into the oven-safe container of your choice, top it with the puff pastry, making sure to tuck the ends of the puff pastry over and into the inside of the dish and into the chicken pot pie so that it seals onto the dish. I cut slits into the top of the puff pastry and then place the container or containers onto a parchment lined baking dish so that it will catch any bubble overs that could occur as it bakes. 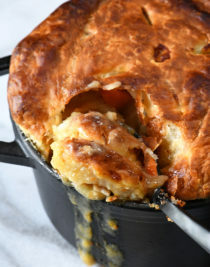 At this point, you can cover each of the chicken pot pies with aluminum by wrapping tightly and storing in the refrigerator for a bit before baking, you can store them in the freezer or you can go ahead and bake as directed. 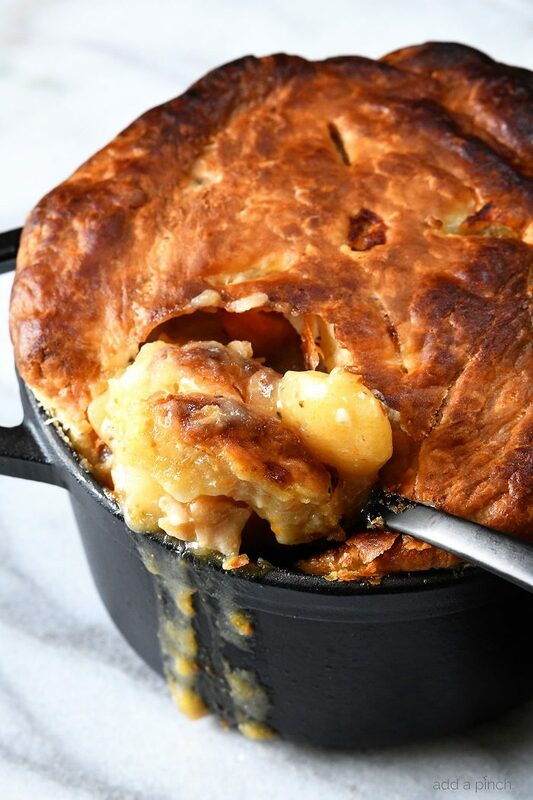 Here’s my Chicken Pot Pie with Puff Pastry Recipe. I hope you love it as much as we always do! 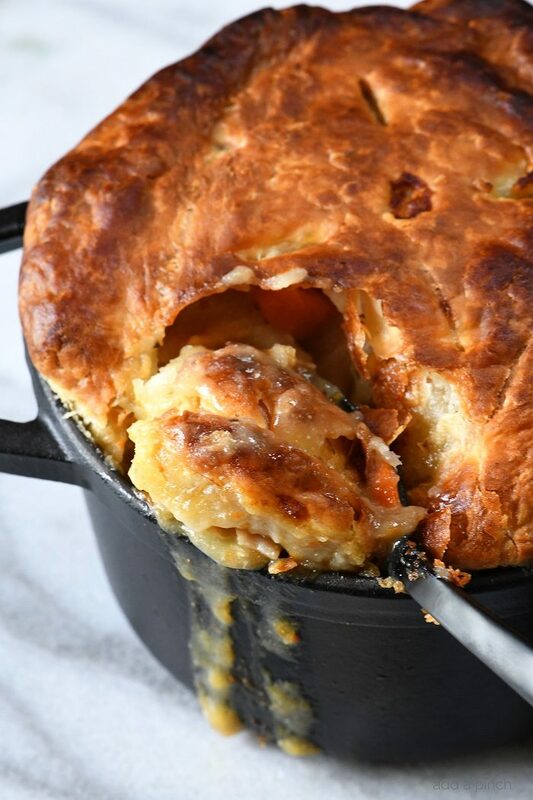 Chicken Pot Pie with Puff Pastry Recipe - A classic chicken pot pie recipe topped with flaky puff pastry and with wholesome, comforting, homemade ingredients. Drizzle the olive oil into a heavy Dutch oven or pot set over medium heat. Add the chicken and cook until browned. 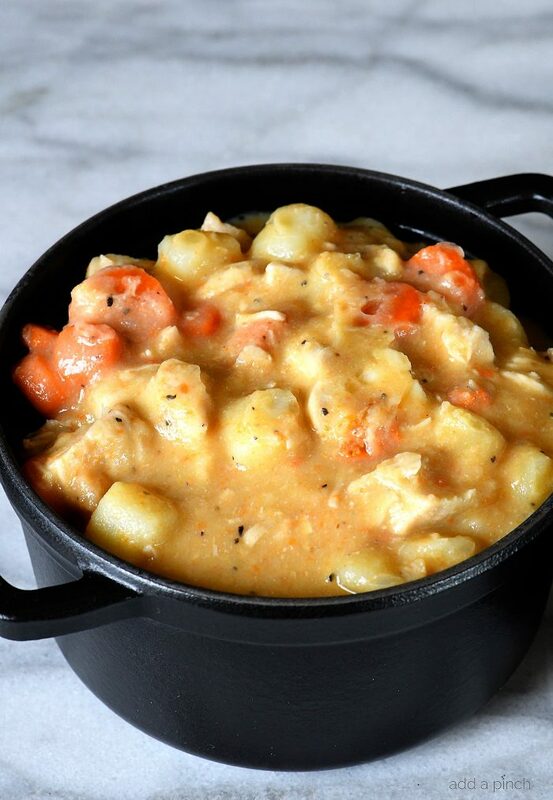 Using a slotted spoon, remove from the Dutch oven to a plate. Add the onions, potatoes and carrots and cook until the onions are translucent and the potatoes and carrots are slightly tender, about 8 minutes. Add the butter and allow to melt. Then, stir in the flour, salt and pepper and cook until thickened, about 2 more minutes. Pour in the chicken stock and bring to a boil. Add back in the chicken and their juices. 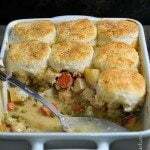 Ladle the chicken pot pie filling into a 3-quart casserole dish or individual dishes set on a parchment or foil lined baking sheet. Top with puff pastry. Trim the edges of the puff pastry to about 1/2-inch overhang of the rim of the baking dish. Using a sharp knife, cut a slit in the puff pastry as a vent to allow steam to escape during baking. Bake until golden brown and the pot pie is bubbling, about 30 minutes. Where is the recipe for the puff pastry? She’s using the pre-made ones I presume. Hi! You can just use store-bought puff pastry or your favorite homemade version. I hope you enjoy it! 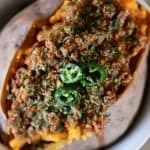 Looks delicious and easy !!! Will make this week. Made it tonight in small casserole pots, added celery and mushrooms, also used Robyn’s Chicken stock recipe. Delicious, everyone loved it, will definitely make again. How many servings did this make to reach your nutritional info? Can we get back to the days of not reading 1500 words before we get the recipe? If you don’t want to read the post, you can always click the button at the top that says “Jump to Recipe”. 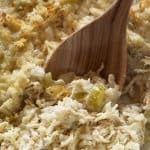 I try to add some helpful tips in my post that may help in making the recipe. Thanks!